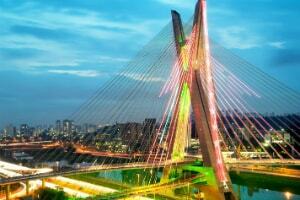 The beautiful city of Sao Paulo, Brazil kindly played host to the latest WSOP International Circuit festival, which ran at the host venue Bienal Pavilion up through this past Wednesday. A week of quality poker action culminated with the R$3,300 Main Event, which was completed late last night. Local player Andrew “Zeus” Kuster took down the massive tournament after a relatively poor start of the official final table. 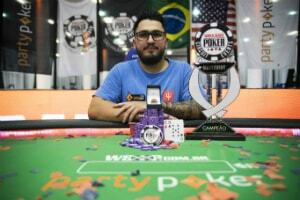 Kuster collected the top prize of R$550,000 and a gold ring, a piece of jewelry coveted by many in the poker world. The R$3,300 Main Event attracted as many as 939 tournament entries. The tournament featured a guaranteed prize pool of R$3 million, which was split among the top 63 finishers. It took three starting flights and three more days of play for a big champion to be crowned. Kuster did not enjoy particularly good first several days. Actually, the player ran pretty low throughout a big portion of the tournament and, as mentioned above, entered the official nine-handed final table seventh in chips with 1.255 million. In comparison, Bruno Borges, who was the chip leader at the time cards were thrown in the air for final-table play, held 6.675 million in chips. Borges was actually the only player to have passed the five- and six-million chip mark at that point. Competition at the final was rough and it was expected that it would be so, particularly bearing in mind that a WSOP Circuit gold ring and more than half a million dollars were waiting for their rightful owner, the last man standing at the final table. Borges, starting off as the chip leader, clearly intended to remain at the top and to eventually scoop the title. The player aggressively made his way through the final table, doubling up his chips and coming closer and closer to the coveted title. However, it was apparently not his to win as the player was eliminated in fourth place. Renan Aziz, who eventually finished runner-up to Kuster, was the other player to put great pressure over the rest of the final-table participants throughout that final stage of the tournament. And it was actually Aziz who entered the heads-up duel as the chip leader. The player held 17 million in chips at that point to Kuster’s 11.8 million. Chips swung back and forth during the first stages of the two-handed match, while eventually Kuster took the lead to never look back and finish off his final opponent. The final hand dealt saw Kuster move all in and Aziz call. The soon-to-be-crowned champion showed [Kd][9c], while his opponent held [Ac][5h]. The board ran out [7h][Kc][4c][2s][4s], securing Kuster with winning two pair. Aziz was rewarded for his excellent performance throughout the tournament and his runner-up finish with the amount of R$350,000 in prize money. The WSOP International Circuit is also currently hosted by King’s Casino Rozvadov, where an exciting festival will be running through October 18.